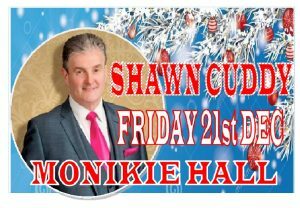 Shawn Cuddy and his band make their annual trip from Ireland to play at the Christmas Dance at Monikie Memorial Hall. Shawn is a great entertainer singing anything from Country, Irish and up to date chart music including ‘golden oldies’. Shawn rocks and sways his way through all the many favourite songs he has recorded much to the delight of his fans that follow him all over the UK and Ireland. Shawn has won many many accolades throughout his 30 years as a singer and an entertainer and this is why he continues to be extremely popular. Shawn is a polished performer and he continues to provide first class entertainment achieving chart success several times throughout his career. When Shawn first started on the road with his band he toured with the late great Johnny Cash and Shawn continues to travel all over Ireland, Europe and the UK. Shawn is also a regular entertainer on the annual Irish Caribbean Cruise from Fort Lauderdale Florida. He has also performed in New York, Nashville, Spain and Portugal. Shawn and the Band are one of the busiest bands in Ireland and they travel the length and breadth of the UK and Ireland every week. They are invited to numerous festivals in Europe and the USA. Shawn and his band always put on such a great show and it’s no wonder he is so popular! Many of Shawn’s fans travel from all over Scotland from as far as Shetland, Aberdeenshire, Fife, Glasgow and Cumbria. Shawn has his own TV show; ‘It’s Country with Shawn Cuddy’ on SKY TV Channel 376 and Freeview Channel 87 and Shawn’s videos are on other country shows on the Keep It Country TV. Shawn and the band always provide a ‘Truly Great Night’ especially at Christmas with a great selection of lively Irish Country and Popular Songs. If it’s “Galway Shawl” or “Ring of Fire” you will hear it here And you will also hear ….Jingle Bells and all the seasonal hits. If you are looking for a lively night out join Shawn and the band at the Monikie Hall, and be prepared to dance the night away or just sit and listen to the music. Why not Bring Your Party to this Party!! You will have a fantastic night. The Dance starts at 8.00 p.m. the hall is open from 7.00 p.m. Please book your table and seats!! Telephone 01382 350250 Or email margocroal@yahoo.co.uk to book your seats. Check out Shawn and the band on YouTube and on Facebook. Check the following websites:- www.shawncuddy.co.uk and YouTube.